In 2007, inspectors received 37,150 complaints about conditions in nursing homes. Roughly one-fifth of the complaints verified by federal and state authorities involved the abuse or neglect of patients. Specific problems included infected bedsores, medication mix-ups, poor nutrition, and other forms of neglect. The proportion of nursing homes cited for deficiencies ranged from 76% in Rhode Island to as high as 100% in Alaska, Idaho, Wyoming and Washington, D.C. Many cases have been exposed in which nursing homes billed Medicare and Medicaid for services that were not provided. A significant percentage of nursing homes had deficiencies that caused immediate jeopardy or actual harm to patients. Talk with family members about your long-term living preferences. Do you want to downsize to a smaller single-family home, or do you plan to stay put in your traditional family home? Take a look at your finances and retirement funds. With your current savings and assets, will you be able to pay for home maintenance? Consider starting a separate retirement savings account strictly for home maintenance. Remodel your home before your mobility becomes limited. As you age, changes in mobility, hearing, vision and overall health and flexibility will affect how easily you function in your home. 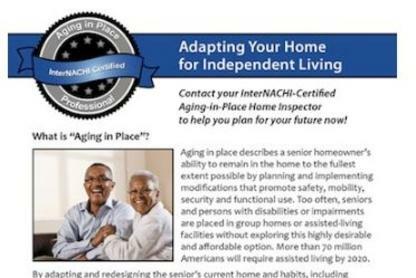 Consider making your home “age-friendly” as a phased-in and budgeted home improvement, rather than waiting until you need many modifications at a time due to a health crisis. 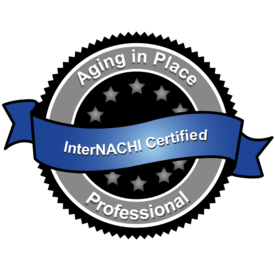 InterNACHI advocates healthy living, as it plays a vital role in your ability to age in place. Most seniors leave their homes due to functional and mobility limitations that result from medical crises, and an inability to pay for support to stay with them in their home. Effectively managing health risks and maintaining a healthy lifestyle can help you stay strong, age well, and live long at your own home.In summary, aging in place is a way by which senior citizens can avoid being dependent on others due to declining health and mobility.